Look at Usher playing big brother to Chris Brown and throwing the brotha a bone. 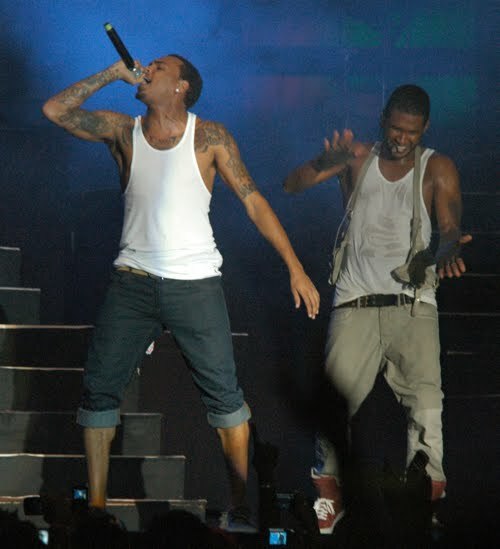 Usher performing at Sumfest in Montego Bay, Jamaica invited Chris Brown on stage. By the way Check out the wet pants of Usher. Looks pretty gross but I'm sure it's not a Fergie moment and it's just sweat from all the dancing he does on stage. No comment on Chris Brown's questionable pants or are those Capris? YIKES!